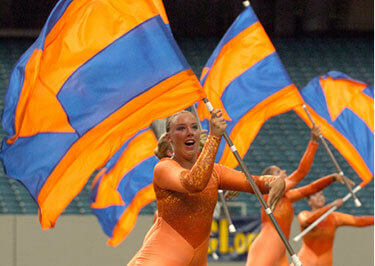 From the Southwind Web site: Southwind is pleased to announce the corps' color guard staff for the 2007 season. The caption will be led by Southwind alum Lindsay Kusmierczak who will head up all parts of the color guard program. She marched as a member of Southwind for two years in 2000 and 2001 before spending four years with Phantom Regiment up until 2005.
in Atlanta during the 2006 season. Kusmierczak said about the 2007 season: "I have always wanted to return to Southwind. There was always a strong sense of camaraderie and family-like atmosphere with the corps. My first summer with Southwind was where I fell in love with the [drum corps] activity. I look forward to continuing the education and growth of the color guard program at Southwind this summer." Read more about all Southwind color guard staff members on www.southwind.org.